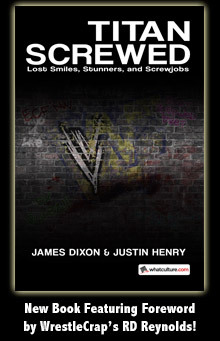 Headlies: Hundreds Of Dead Wrestling Angles Found In The Basement Of Titan Towers - WrestleCrap - The Very Worst of Pro Wrestling! 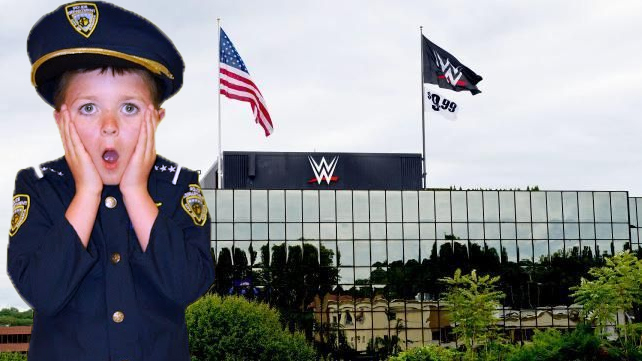 Stamford, CT – Local and state police officers were called to Titan Towers, the headquarters of WWE, after a gruesome discovery was made in the company’s basement. Earlier this week, WWE announced that they were moving to a new office complex in 2021 after decades at Titan Towers. The grisly discovery was made during a routine walkthrough from building inspectors, realtors, and potential buyers. Detective Nelson gazed quietly in to the distance as a rookie police officer threw up behind a squad car. Amid the investigation, WWE CEO Vince McMahon made a quick statement before Monday Night Raw. 6 Responses to "Headlies: Hundreds Of Dead Wrestling Angles Found In The Basement Of Titan Towers"
Next they’ll hopefully look in The Aisle of Lost Merchandise section in the basement. Tekno Team 2000 foam fingers, “Conan” Chris Walker action figures, Sivi Afi posters, Big Bully Busick fake mustaches or the autographed Aldo Montoya jockstrap/mask costume set. I would’ve gone with the punchline where Vince was legitimately arrested because Stanford PD thought the stories were either criminal confessions or intricate plots of terrorism from the McMahons themselves. I hope they didn’t stumble across the remains of Jason Jordan being Kurt Angle’s son! I wonder if they found Eric Angle in that basement as well.